Whether they're called "Preview Days," "Open House," or some other name, visit days are a different take on the typical college campus visit. If you're a high school student and you are planning to go see a college anyway, they are a great option to consider. 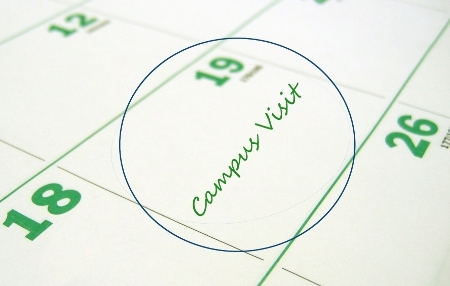 Visit days are structured programs hosted by a college. The school may offer a single event or several visit days throughout the year. Some take place during the fall or spring semester, while others can be combined with university tours during the summer. Visit days include several campus visit activities you might otherwise have to plan individually. The colleges are trying to give you a more complete perspective on what it's like to be a student than you might get if you just show up, tour yourself around, and then head off to your next stop. Learn more about what a university may offer and how you can participate. Official welcome: Usually, the admissions office will greet visit day students and parents and offer a preview of what to expect during their time on campus. Information session: This may be combined with the official welcome. You'll learn how to apply, find out about housing for students, and get an introduction to financial aid. Some colleges offer special activities, such as mock admissions interviews, to help you prepare for the road ahead. Campus tours: Most visit days will include a walk around the college so that you can see the main quad, a sample classroom or two, the student union, and athletic facilities. You may also learn about the area around and near the college and amenities such as supermarkets and shopping centers. Tours during visit days often offer opportunities you can't have on a regular campus visit, like residence halls tours. Meet students: If you have questions for college students, visit days can be a great way to start a conversation. Many colleges offer special meet-and-greet events or a panel session where you can talk with students about their experiences. Eat in the dining commons: Colleges may host you for a meal on campus during visit days. The dining commons are another great way to meet current students since it's a big gathering place and students usually have more time to talk than if they're on their way to class. Speak with faculty: Some colleges offer an academic presentation. Others arrange for breakout sessions by major or school. However it's organized, having the chance to speak with some of the faculty lets you learn about the academic opportunities available to you, such as research, assistantships, internships, and publications. Get to know student organizations: Visit days are sometimes combined with student organization fairs or fraternity and sorority events. This offers a great way to find out about the activities available on campus, to meet students who share your interests, and to decide for yourself whether the college's culture is a fit for you. Spend the night: Visit days often become visit nights, as colleges may invite high school students to stay overnight during a campus visit. It's one of the best ways to see life outside of the classroom and find out what to expect when you become a student. These visit day events let you experience a lot of what the college has to offer, from academic programs and professors to students and clubs to residence halls and life outside of campus. The best visit activities are all offered together, conveniently scheduled so that you can get a complete view of the college's resources in a single day. What's more, visit days often bring together big groups of high school students who, like you, are exploring the college for the first time. This means you can meet a lot of people who may apply, and you can decide if they're the type of people you want as your future classmates. In the best case, you'll make a lot of new friends before you arrive on campus. Still, college visit days aren't always the best approach. It depends in part on where you are in your college search. Visit days will likely provide you with the most positive aspects of the college and may ignore negatives. Also, when you visit alongside a large group of other high school students, the experience may be less personalized or give you less of a chance to see the college through your own eyes. For more information on the differences between official and unofficial visits, check out our article on self-guided campus tours versus college-organized activities. If you decide that you want to travel to campus during college visit days, use the Go See Campus College Trip Planner. Just add a college to your trip, and then click "Activities." Open House and Special Events will usually be listed if the college offers them, but be sure to visit the college's official admissions page to see if there have been any recent updates. Have a great time on your college visit days, and good luck in your search!